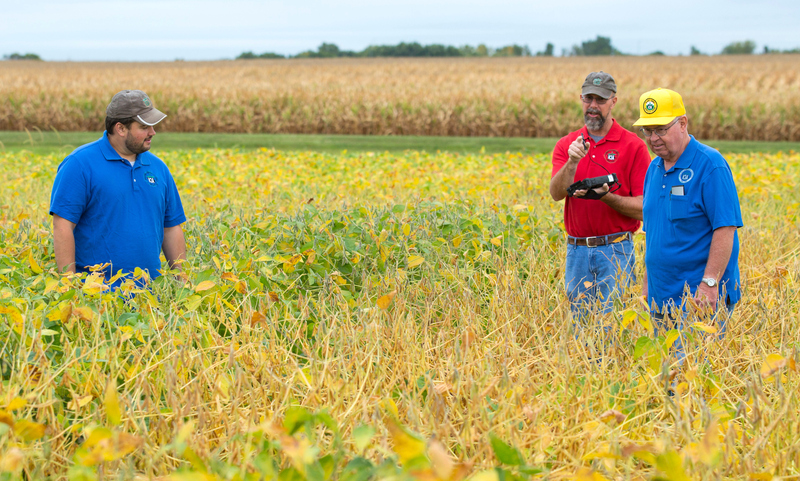 AMES, Iowa — The Iowa Crop Improvement Association, an Iowa State University affiliated nonprofit, is marking the 50th anniversary of its Iowa Crop Performance Tests for Soybeans, which offers Iowa farmers independent information to help select the best soybeans for their needs. “The soybean test is a tool to help Iowa farmers make decisions, but seed companies also participate so they can promote their products to farmers,” said Jim Rouse, executive director of ICIA, who holds a staff appointment in Iowa State’s Department of Agronomy. From 200 to 250 soybean varieties, selected by seed companies or ICIA staff, are tested each year. The varieties are tested within three districts encompassing all of Iowa — north, central and south, and each district has five testing sites. Varieties are subdivided based on maturity, to include both early and full-season testing. At the end of the season, ICIA analyzes the data and publishes the yield results in print and online. Results are available to the public beginning in October of each year at: http://www.croptesting.iastate.edu. The results are distributed by Iowa Farmer Today, Iowa Farm Bureau Spokesman, Agri-News and the Iowa Soybean Association. Results also are available on ICIA’s website, and PDFs of the results are available for download in the ISU Extension Store. Although there was some soybean crop testing in the state, the standard for modern-day testing was established in 1967 by Walter Fehr, Charles F. Curtiss Distinguished Professor of Agriculture and Life Sciences and professor of agronomy at Iowa State. “The Iowa Crop Performance Tests have always been tightly linked to the agronomy department’s plant breeding program and we have strong programs in both soybeans and corn,” said Kendall Lamkey, chair of the Department of Agronomy. Dean McIntosh, a farmer from Missouri Valley, Iowa, reviews the test results every year. His farm provides ICIA with a testing plot for the soybean and corn tests. ICIA also tests corn hybrids. Its Iowa Crop Performance Tests for Corn will mark its 100th year of testing in 2019. The Iowa Crop Improvement Association has been serving Iowans since 1902. The nonprofit organization is the official seed certifying organization for the state. The purpose of the association is to promote the use and production of improved seed stocks, to conduct testing regarding the adaption and performance of cultivars and to support opportunities in leadership, research and education related to crop improvement. Iowa Crop Improvement Association financially supports Iowa State University Crops Team, a student organization; sponsors the Iowa FFA Agronomy Career Development event; offers a summer internship program; and awards several annual scholarships to Iowa State students.